This past Friday, a group of eager and curious faces took a trip to the local Dominican Restaurant of Uniondale, NY, in celebration of Hispanic Heritage Month. My name is Joanna Soares and I am a first year student at Hofstra University pursuing a degree in Public Relations. Working and learning from people of all demographics is a passion of mine, and I believe it leads to a more well rounded perspective. Growing up in the suburbs of New Jersey, I did not witness as much diversity as I would have liked. I do, however, have fond memories of visiting the "bodegas" with my Abuela in Newark, New Jersey. I often filled my days daydreaming about my Latina ancestry, all the while inhaling the sweet aroma of Abuela's meals filled with love and listening to "bachata," a music genre native to the Dominican Republic. Since those childhood days in the city, I aspired to further my education in a similar community, where people of all different backgrounds not only co-exist but truly build and develop from each other. Now that I am in college, where within the university alone I am surrounded by more insight and a range of backgrounds, but also in a town where my Latina culture is especially evident, I have found the diverse lifestyle that I have sought for so long and I couldn't be happier. Now you can see why I was so excited when I was invited to partake in not only visiting the Dominican Restaurant for a delicious dinner but taking a lead in educating my peers on the heritage that I am so proud of and have waited so long to be embraced. Our group consisted of mostly commuter students, and a third were international students from China. The event, “Flavors of our Neighborhood,” was put on by Hofstra University’s Off Campus Living and Commuter Student Services in collaboration with the Multicultural and International Student Programs Office. Gustavo, the Restaurant’s owner was very pleased to see new students enjoying his restaurant and delicious cuisine. To begin, the students tasted Chinola, a traditional Dominican juice made of passion fruit. The sweet taste put a smile on everyone’s face and excitement cooked up among the students to enjoy the rest of dinner! The staple Latino dish, Arroz con Pollo, with a side of a Caribbean favorite, Platanos, was served by gracious and enthusiastic waiters. 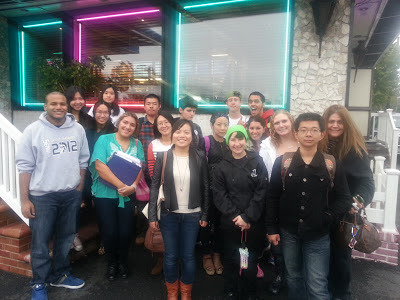 After all, it is not every day that a group of 22 Hofstra students visit the Dominican Restaurant. After I spoke to the students about the history behind these dishes, the Chinese students were surprised to find out that platanos, or plantains, are indigenous to Asia. It was enjoyable to realize that our history has connections and to inference on the influences between cultures. Afterwards, Anita Ellis, the Director of Off Campus Living and Commuter Student Services, shared some educating historical information with the group regarding the town. Not only was this trip fun but it was informal and left everyone feeling much more connected and comfortable in our relatively new home of Uniondale, NY. Personally, I am thankful for the experience to have been able to share some of my knowledge with students, as I take pride in my culture and love to find others who are interested in expanding their cultural knowledge. Additionally, the students benefited by finding a restaurant, in walking distance where they could eat. It is important that they become comfortable and aware with their environment and this was a perfect hands-on way to do so. Finally, I saw it as a great experience for the restaurant itself. Local businesses should be supported and it humbled me to watch the servers and owner glow with excitement due to our group being interested in their culture, their dishes, and that our university remembered their family-owned restaurant this month. Friendships were made, connections were strengthened, diversity was embraced, and much was learned. College is a beautiful character-developing experience and it is moments like these where I remember that so much of this development happens outside of the classroom. Be sure to check out the Closing Reception for Hispanic Heritage Month today during Common Hour in the Student Center Plaza Rooms. Plus, the next Flavors of Our Neighborhood will be in December, where we will explore a Haitian restaurant. Come by the Off Campus Living and Commuter Student Services or the Multicultural and International Student Programs Office for more details! Thanks for shairing this blog post.Very nice. Hofstra Makes Strides Against Breast Cancer! Students made #HofDebate a success! Consider a Career in Student Affairs! LGBTQ Heritage Month Kick Off!